Back in November, I wrote a post about the End Of An Era. I humbly signed off from a most exciting (albeit sometimes tiring and work-filled) period of my life as the One-Act director. In my various bits of resignation communication with the administration, I warned of the difficulty in finding someone to take the position and that I feared the district could possibly use that to cut the entire program. I had hope, really I did. I should be clear -- the district has not cut the program at this time, nor do I speculate that it will. However, I found out this afternoon that there will be no 2008 One-Act, which is truly a pie in the face in a strong and proud group of students. The reasoning I've heard at this point is essentially a combination of unfortunate things -- lack of student involvement (a really sad situation) and a new director. I'm sure there are other smaller circumstantial things as well. I give the person who was doing this year's One-Act an incredible amount of credit. She was not familiar with the One-Act format nor its intricacies. But she took it on and tried. And that's what really matters. The One-Act is a unique beast, and as simple as it sounds, in many ways I always found it more challenging and complicated than the longer shows. After all, it was for competition purposes. So I feel for the director, but I really feel for the students. There's a core group that will be watching instead of performing for their senior year. Their dedication and love for theatre is inspirational, and I am sad that one of the few theatrical outlets for them will be unavailable this year. 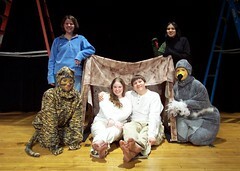 Do I think this could have been avoided if I were still doing One-Act? Absolutely. That doesn't mean it would be easy; the student involvement aspect is an incredibly complex and integral part of any school-sponsored production. Without students, there can be no show. I hold out hope that they will move on, shrug off this year, and come back more knowledgeable and dedicated next year (for those who will be able to do it next year). That applies to both the students and to the director. 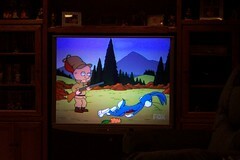 We were watching the Family Guy 100th episode special, and I randomly took a picture of the TV. To Pay Per Channel, or Pay For A Package? I heard another report (on the radio) recently that the Federal Communications Commission is once again taking up the à la Carte cable channel issue. This is really nothing new with the FCC or the media in general. Personally, I think it's a good and bad idea. All at the very same time! :) As a satellite television subscriber, I welcome the opportunity to 'cut the crap' from my channel lineup while allowing me to hand-pick a few of the channels for which I would now currently need to pay an additional $5-10/month (by subscribing to a higher tier and receiving thirty more channels I don't want, but the two I really did want). At the same time, I'm not convinced that there may necessarily be any significant savings by having this switch (or option) available. When we lived in town and had 'proper' cable television service, we frequently would receive notices (once or twice per year) that the base rate would be increasing. The argument: new channel offerings bump up the rate for everyone. The fact: cheap channel 'profits' can only subsidize so much of the expensive channel cost. To date, we've only experienced one or two small increases in the satellite rates, and I have to say that I've been relatively pleased with how my provider (DirecTV) seems to be handling the situation. If I could get on the order of 50 channels for less than what I currently pay right now, I would certainly jump on that bandwagon. And if I could manage that dynamically through an online account (the channels to which I subscribe), that would be even better. You could do the 'try before you buy' or switch them off and on as necessary. I could go on (and I won't), but this could be one of those situations that is 'too good to be true.' One must be careful in that for which one wishes. Look at the NFL network or the BTN (Big Ten Network). They're possibly prime examples of what could happen if not everyone is forced to subscribe to them (such as channels like ESPN) -- with ginormous (yes, that's an official word now) rates that only the most dedicated (read: ridiculous) fanatic could justify paying. - Don Quixote - "Man of La Mancha"
Selected frames from Attempt #1 of Matt's Boiling Water Experiment (YouTube). 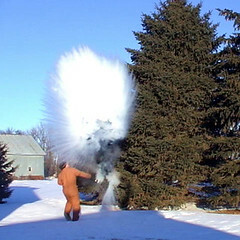 At -12F, a quart of boiling water thrown in the air above one's head results in this huge cloud of steam and about a half cup of snow/ice pellets falling to the ground. The majority of the water evaporates instantly. The low temperature of the entire weekend occurred at 4:17AM, Sunday, January 20, 2008. It reached -24.3F. That's pretty cold, and I'm glad I was in bed at the time. Ever since then it has been warming up (as promised) and, while still cold, is more tolerable in part to the fact we've all become acclimated to the cold of winter. So here's to old man winter...and also to science!